FREE ON YOUTUBE (DU FINDEST DEN GANZEN FILM FREI AUF YOUTUBE) Ich habe im Atlas nachgeschlagen. Somers Town? Nicht gefunden; beim besten Willen nicht. Ein britischer Kunde unserer Videothek aber hat mir beigebracht, dass Somers Town ein Ortsteil von London ist. Und selbst das wissen nur wenige! Shane Meadows nutzt diesen klangvollen Namen für eine sanfte Komödie mit Thomas Turgoose, Meadows toller Entdeckung! Er spielt Tomo, einen frechen, offenherzigen Jungen aus Nottingham. Der rennt von Zuhause weg, denn dort ist alles kaputt. In London steigt er aus dem Zug aus, ohne den leisesten Schimmer, was er nun tun soll. Er sammelt Erfahrungen mit der Londoner Strassenkriminalität und trifft dann den verträumten Marek (Piotr Jagiello). Marek ist ein einsamer Junge. Er ist verknallt in die Bedienung französische Maria (Elisa Lasowski). Tomo beschliesst, dass auch er in Maria verliebt ist. Nachdem Maria nach Paris zurück gekehrt ist, machen die beiden Jungen untereinander aus, sie zu aufzuspüren... Somers Town wirkt wie ein Kurzfilm, den Meadows auf Spielfilmlänge ausdehnte (dementsprechend ist Somers Town auch nur 75 Minuten kurz). Das ist aber kein Nachteil! Vieles bleibt in der Schwebe, aber das hat bestimmt auch den Grund, dass in dem Alter von Tomo und Marek die Freundschaft zählt - und noch nicht die Liebe. Der Weg ist das Ziel! Nicht das Mädchen. Tomo erklärt Marek, dass er Marias rechtmässiger Besitzer ist. Mit einem frechen Grinsen, aber auch herzzerreissender Verletzlichkeit. Das ist der Ton von Somers Town. Ein glücklicher, sonniger Film! - FREE ON YOUTUBE I looked it up in the atlas. Somers Town? Not found; not by any stretch of the imagination. But a British customer of our video store taught me that Somers Town is a district of London. And only a few people know that! Shane Meadows uses this sonorous name for a soft comedy with Thomas Turgoose, Meadows great discovery! He plays Tomo, a cheeky, open-hearted boy from Nottingham. He runs away from home because everything is broken there. In London, he gets off the train without the slightest clue what to do. He gains experience with London street crime and then meets the dreamy Marek (Piotr Jagiello). Marek is a lonely boy. He has a crush on the French waitress Maria (Elisa Lasowski). Tomo decides that he too is in love with Maria. 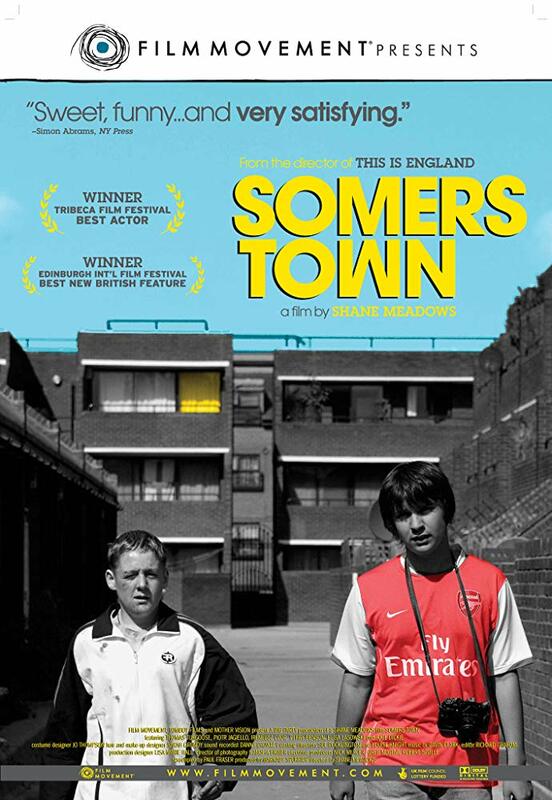 After Maria returns to Paris, the two boys agree to track her down... Somers Town looks like a short film that Meadows extended to feature length (accordingly, Somers Town is only 75 minutes short). But that's not a disadvantage! Much remains in the balance, but that certainly has the reason that at the age of Tomo and Marek friendship counts - and not love. The way is the goal! Not the girl. Tomo explains to Marek that he is Maria's rightful owner. With a cheeky grin, but also heartbreaking vulnerability. That is the tone of Somers Town. A happy, sunny film!